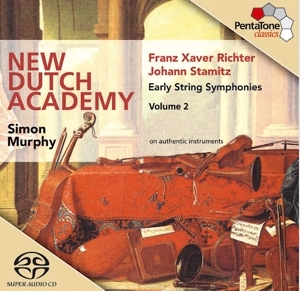 Founded by conductor and violist Simon Murphy, The New Dutch Academy (NDA) is an award-winning group of 40 international young, highly engaged, specialist musicians from around the world who gather in The Hague to explore and perform 18th century music in all its forms. 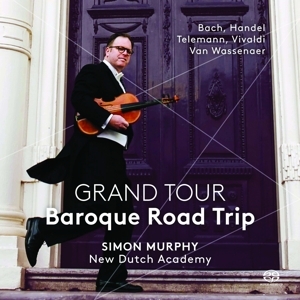 Performing exclusively on authentic instruments, and appearing in its two forms – Chamber Soloists (4 to 12 musicians) and Chamber Orchestra (25 to 40 musicians) – the NDA has quickly won international acclaim for its fresh, vibrant and dynamic performance style, ever since its establishment in 2002. The NDA's innovative programming of classic as well as newly rediscovered 18th century masterworks offers modern audiences inspiring new insights into the music of composers such as Bach, Mozart, Beethoven and their contemporaries. The NDA's musical activities celebrate the rich and vibrant nature of 18th century music, presenting this through symphonic, Baroque and chamber concerts, CD recordings, broadcasts, digital applications, multi-disciplinary presentations, musical editions, education programmes and international touring. In concert, the NDA orchestra regularly appears at the leading international festivals including the Holland Festival of Early Music Utrecht, Flanders Festival, Händel Festspiele Halle and the Bachfest Leipzig. Tours have seen the NDA perform throughout Europe, Russia, America, Asia and Australia. Recent highlights at home in the Netherlands include Händel's The Water Music for the ZaterdagMatinee at the Het Concertgebouw Amsterdam and concert series of the symphonies of Mozart, Haydn, Beethoven and Mendelssohn for Dutch radio. 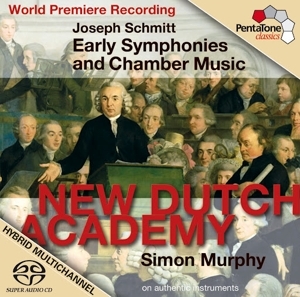 The NDA's CD recordings have presented the vibrant symphonic works of many rediscovered 18th century composers to the world for the first time, including “The Dutch Haydn” Joseph Schmitt, and The Hague court musicians Graaf and Zappa. 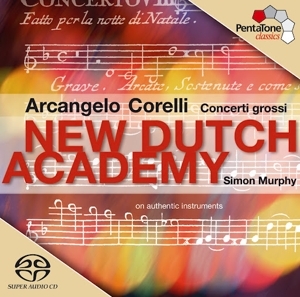 Murphy and the NDA's ground-breaking recording of Corelli's iconic Concerti Grossi made at the Holland Festival of Early Music Utrecht in 2003 was recently voted one of the top five highlights in the festival's 30 year history. 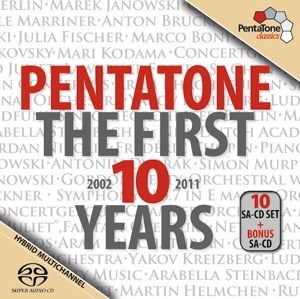 Since its establishment in 2002 the orchestra has attracted much interest from audiences and the international press for its exciting performance style and fresh approach to early music. In particular, the NDA has won praise for shedding new light on the richness of the 18th century music culture, for example with its work investigating and profiling the Mannheim and Dutch 18th century symphonic schools – and through the NDA’s multidisciplinary projects which connect music with other 18th century art forms. The orchestra's repertoire ranges from large scale Baroque works such as Corelli's Concerti Grossi and Handel's Water Music to works of the mid 18th century symphonic schools of Mannheim and the Netherlands through to the large scale symphonic works of later 18th century/early 19th century masters such as Haydn, Mozart, Cimarosa, Pleyel, Beethoven, Wranitzky and their contemporaries. The orchestra also performs many works newly discovered by the NDA's own research department The NDA “Research Lab”. Recent concert tours have seen the NDA orchestra perform throughout mainland Europe, Scandinavia, Russia, Canada, the U.S., Asia and Australia. Through its own concert series and its annual multidisciplinary NDA festival the NDA also maintains a busy schedule of performances at home in the Netherlands. The NDA has performed at all of the leading halls in the Netherlands, from the Concertgebouw (Amsterdam) to De Doelen (Rotterdam) and Vredenburg (Utrecht). Internationally, the NDA has performed at the leading international festivals, including the Holland Festival of Early Music Utrecht, the Festival of Flanders, the Roma Europa Festival (Italy), Potsdam Festspiele, the Mitte Europa Festival (Germany and Czech Republic), the Brezice Festival (Slovenia) and the Sacharov Festival (Russia), the Händel Festspiele in Halle, the Thüringer Bachwoche in Weimar and at the Nothern Lights Festival in Norway. Recently the NDA was involved in a series of lectures and performances at the Getty Center in Los Angeles, U.S.A.
NDA concerts have been broadcast across the world by the EBU and the NDA has worked further with, amongst others, Radio Netherlands Wereldomroep, AVRO, NPS, Deutschland Funk, Hessischer Rundfunk, RAI, Klara and the Australian Broadcasting Corporation to achieve special radio concert broadcasts and documentary programmes with new 18th century repertoire. The NDA works closely with the Netherlands Ministry of Foreign Affairs as a cultural ambassador on projects that celebrate historical cultural relationships and which foster international cultural understanding and exchange. In 2004 the NDA performed rediscovered Dutch and Italian Baroque music in the Palazzo Quirinale in Rome for Her Majesty Queen Beatrix and the President of Italy during the Queen’s State Visit to Italy. In 2006 the NDA celebrated the 400 year relationship between the Netherlands and Australia, giving special concerts, broadcasts, master-classes and workshops in both countries. In 2009, at the invitation of the Foreign Ministry, the NDA opened the cultural olympiad in Vancouver, Canada with performances of specially selected 17th and 18th century Dutch repertoire. Also in 2009, the NDA was part of the celebrations of the 400th anniversary of the founding of New York by the Dutch with performances of 18th century Dutch court music in the U.S.A. at the invitation of the city of The Hague.